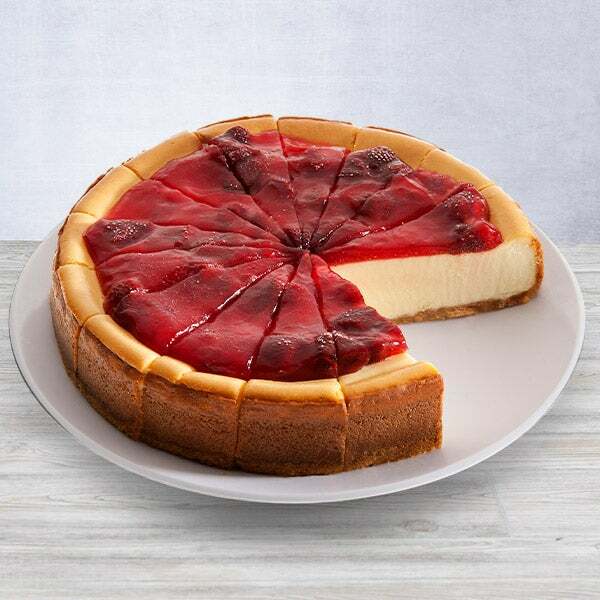 New York Strawberry Topped Cheesecake is rated 4.9 out of 5 by 10. Rated 5 out of 5 by jec1 from Loved it! All my family and friends love it! I Wii do it again! Rated 5 out of 5 by Vonnie from Strawberry CC Birthday gift everyone loved the cake! Thrilled shipping on time. Will shop here again. Rated 5 out of 5 by Giaandsteph from Highly satisfied I bought it for my gf and she loved it! I'm super happy about it . Rated 5 out of 5 by Jim in Ohio from New York Strawberry Topped Cheesecake My wife loves the New York Style Strawberry Cheesecake from GourmetGiftBaskets. Rated 5 out of 5 by Shanna Poo from My Daughter said it was great. I bought this and had it shipped to my daughter after she gave birth to my granddaughter. Rated 5 out of 5 by PEACH from GREAT PRODUCT AND SERVICE I purchased a cheesecake and had it delivered....EVERYTHING WAS PERFECT! Our award-winning cheesecake is certainly delicious (it is, after all, award winning), but we've decided to dress it up a bit. This delicious dessert is our creamy, rich New York Cheesecake topped with juicy, ripe strawberries in a sweet strawberry compote. It's okay to indulge in this perfect blend of smooth cheesecake and succulent strawberries.